In Manufacturing Consent, Noam Chomsky y Edward S. Herman outline what they call a “Propaganda Model”, describing the "invisible" forces capable of ensuring that: the media fulfills the role of propagandists, that they transmit tendentious news rather than actual news, that they obey their masters even without being prompted. 1° Filter – Size, Ownership and Profit Orientation: The enormous wealth of media owners, the fact that property is concentrated in the hands of a few giant companies and that they, like all businesses, are there only to make profits. Large financial requirements constitute a major obstacle to anyone who wishes to break into this market. Only the very rich can run for it. Property has increasingly concentrated. En 1982, Ben Bagdikian found that here were 50 companies that controlled almost all media sales in the United States; in the fourth edition of his book, in 1993, the figure had fallen to 20 and continued to decline. The "influential media" are those who occupy the top tier in terms of prestige, resources and coverage. They comprise about 10 to 24 companies which, with official wire service, define the course of action to be followed in the information field and provide news itself to most of the lower category companies. 2° Filter – Advertising: Main source of income. Before the rise of advertising, the price of a newspaper had to cover its production cost, but if advertisers funded it, a publication could be sold for less than the production cost. This rules out newspapers that fail to get advertisers. Advertising distorts the news because it makes the publication address to their interests and not those of its readers. TV audiences are not considered to be "citizens" but "consumers". Sponsors want entertainment shows that question as little as possible and do not cause disturbances. 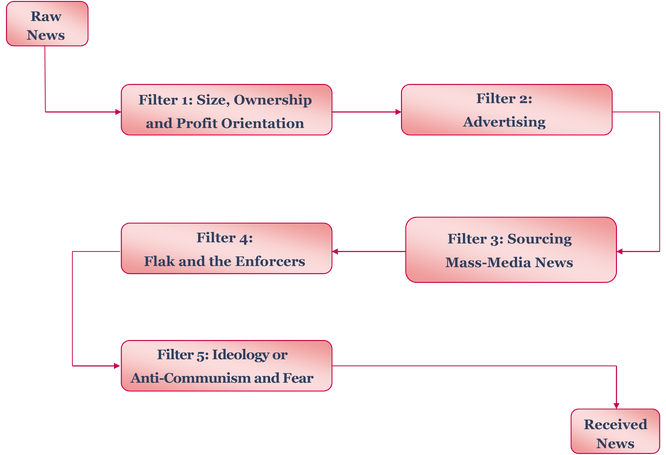 3° Filter – Sourcing Mass-Media News: Provided by the government, companies and "experts". Media's bureaucracies have affinity with State’s bureaucracy and companies’ bureaucracy, and are based on them to satisfy its need of continuous flow of low cost news. On the other hand, if one were to doubt the "official version", one could only consult the experts. Of course, they can be won over by the big companies' cause or official interests by funding and sponsoring them, or by including them among their employees. 4° Filter – Flak: A way of disciplining the media. Censorship is expressed in negative reactions to the media's statements, in the form of letters, phone calls, petitions, lawsuits, speeches, bills and other forms of punitive action. In certain circumstances, censorship can make functioning very difficult to a press organ. One of the biggest ironies is that despite these "filters" pro-business, pro-government and pro-status quo which bestow a dangerous right-wing bias to the media, they are constantly accused of leftists. 5° Filter – Ideology or Anti-Communism and Fear: A way to control the mechanism. Although the United States was created thanks to a revolution, in our time, the word revolution is identified with a malicious threat. Russian, Chinese and Cuban revolutions were very dangerous to ruling elites because communism could undermine their position as upper class. This malevolent presence offered an enemy against which to mobilize the population. Anti-Communism remained to be the center of North-America's political ideology until the fall of the Soviet Union in 1988. When the fall occurred, there was some hesitation among the propaganda experts as to who should occupy the position of the Evil Empire as an enemy. Saddam Hussein was useful to them for a while, but a safer and malleable image was the one of the Islamic fundamentalists, Muslims and Middle Easterners in general, who are described as if they had the cultural characteristic of being extremists and terrorists at any cost. Authors / References: Noam Chomsky, Edward S. Herman.